​I had very little idea what I actually wanted, and was blown away by the results. Everyone has commented on my hair, even my new husband! 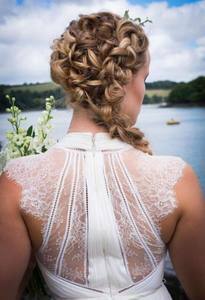 Elliegant hair ​is very proud to have ​been listed as one of the top 6 wedding hairstylists in Cornwall by Cornish wedding website eeek​! You can read the full post here. ​​​Ellie recently did my hair for myself and my mum for my wedding. For our hair trial Ellie was really great, looking at some pictures and recreating exactly what I was after. My mum was also off to an evening do where she felt fantastic with her lovely hair. In the run up Ellie was super organised sending out a timetable and made me feel really at ease. My mum and I both loved our hair on the day, which stayed really well, despite travelling to our reception venue on a boat and open topped sports car! Would highly recommend Ellie, she is both lovely and super talented! 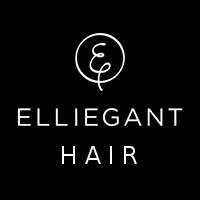 Elliegant hair provides perfect styling for your wedding day by creating a bespoke hair package for you and your bridal party, so you can relax and enjoy your special day. ​Ellie did an incredible job of my hair for my wedding, as well as my mums and two bridesmaids. Having never met before I was a little nervous, but she made me feel completely at ease and totally understand what I wanted straight away - I have a lot of hair so it's not an easy job. We all loved our hair and would recommend her to anyone. I can't thank you enough Ellie! ​Following an enquiry, an initial quotation may be offered on request. 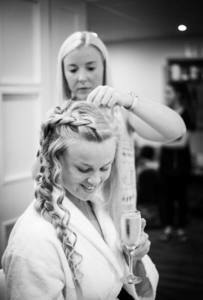 Final quotations include your bridal hair styling and that of other bridal party members. Once your booking is secure, ​I will carefully formulate a timetable for hair styling on your wedding day, helping ensure yours runs smoothly and enjoyably. 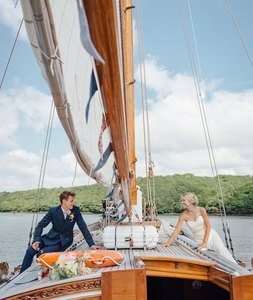 To offer you complete peace of mind and to help you feel relaxed on your wedding day, ​I aim to finish an hour prior to your departure, giving you time for last minute touches, photographs or even a glass of bubbly! ​So if you are planning your big day please get in touch as early as you can. As you can imagine, my wedding weekends get booked months in advance.